Celebrating more than 50 years on the hill at Lonas Drive! 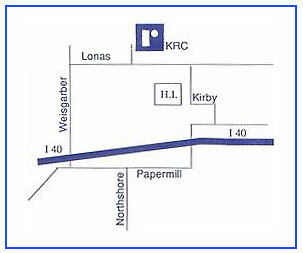 If traveling west on I-40 from downtown Knoxville, take exit 383, Papermill/Weisgarber, staying in the Weisgarber lane. Turn right on Weisgarber Road. Turn right at the second light, Lonas Drive. Travel 1/4 mile, turn left into our drive. It is clearly marked. If traveling east on I-40, take exit 383, Papermill and take a right on Papermill. Take a right on Weisgarber going under the interstate. Take a right at the second light, Lonas Drive. Travel 1/4 mile, turn left into our drive. It is clearly marked.